Leaner Tip: Substitute mayonnaise with non-fat/low fat greek yogurt to reduce recipe by ~800 calories per 1 cup. Place 10 eggs in a pot of water and turn on the gas stove to medium heat and boil eggs for about 14 min. Drain the water and remove the shells once the eggs have cooled. (optional) Refrigerate the eggs for 60 mins so the eggs will keep its shape. Then cut eat egg in half, vertically, and scope out the egg yolks. Set aside one egg yolk for the egg filling and discard the other yolks. 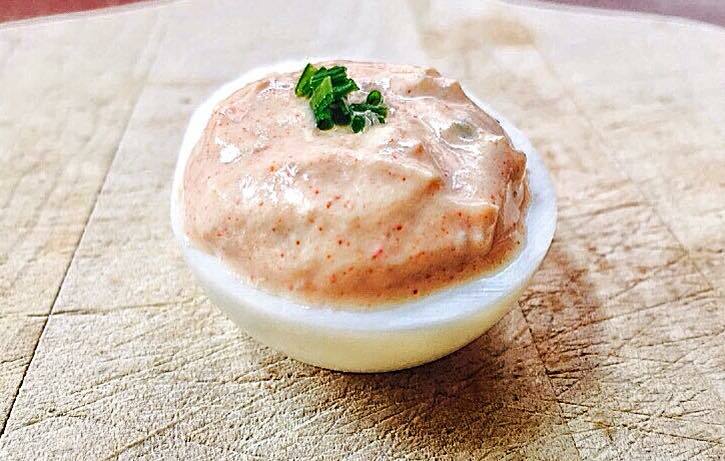 To make the egg filling, add the one cooked egg yolk, low fat plain greek yogurt, paprika, salt and minced shallots into a bowl and mix until you get a creamy texture. Fill each egg white half with the egg filling. Feel free to garnish with a sprinkle of chives. Optional – Use any remaining egg filling as a paste for your sliced cucumbers to add veggies to this recipe.